Elena Michaels is the world’s only female werewolf. She was bitten by her lover Clay (another werewolf) many years ago and turned into a werewolf as a result. It is unusual for females to survive the change but she did and, even more amazingly, she eventually came to forgive Clay for biting her. She is a member of a small pack of werewolves and now lives a settled happy life with Clay in New York State. A few years ago Elena was kidnapped and during that time she made the acquaintance of a not entirely trustworthy half-demon called Xavier. Xavier calls her out of the blue with a proposition; he will let her know the whereabouts of a rogue werewolf that she and the pack have been hunting in return for her undertaking a small job for him. The job seems easy enough. Xavier wants her to steal Jack the Ripper’s “From Hell” letter out of the collection of a Toronto business man. This didn’t present too much of a moral dilemma because the letter itself was already stolen property, taken from the London police files, and the werewolves really needed to find the rogue wolf before he killed any more people. To start with everything seems to go according to plan. Elena, Clay and pack alpha Jeremy steal the letter and make a clean get away. 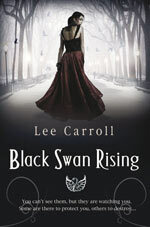 When they stop to look at what they have stolen, Elena accidentally triggers a spell that had been placed on the letter and as a result they open a dimensional portal connected to Victorian London. Opening the portal releases a couple of rotting zombies onto the streets of Toronto and whilst the zombies seem easy enough to kill they just won’t stay dead. The portal also unleashes a cholera epidemic and aggressive, diseased killer rats upon the city. The pack knows that it is their responsibility to close the portal but they don’t know much about the magic that made it or how to stop it. Elena is extremely tough but this time even she may have bitten off more that she can chew. After all, chasing zombies is not a suitable activity for a heavily pregnant werewolf…. Broken is another thoroughly enjoyable book from the pen of the talented author Kelley Armstrong. She has created her own ‘otherworld’ for her books peopled with werewolves, vampires, necromancers, zombies, ghosts, witches, demons and sorcerers. They live alongside a largely unsuspecting population of regular humans who go about their lives in blissful ignorance of the other races who dwell amongst them. All in all the vampires are not the most exciting creatures in Kelly Armstrong’s books but with so many other interesting characters and creatures in the stories there is no room for complaint. 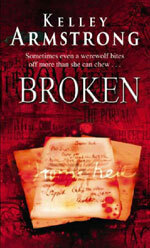 Broken is told first person by Elena, so the story comes from a female and werewolf perspective. It is well written and follows one main plot line, which is closing the portal. The mystery part of the story is well plotted and with there being several likely suspects throughout the story for who is keeping the portal open and controlling the zombies the reader is not certain until the end of the book which character is behind it all and why. Broken is an action packed book and a fast read, recommended for readers who like strong female lead characters (even though in this book Elena is pregnant she’s still tough!) werewolves and supernatural mysteries.